This deal marks Samsung’s global first hardware subscription deal within the build to rent market. The deal has been constructed using Samsung Capital to fund the kit as well as on-going maintenance and provide a turnkey solution on a hardware-as-a-service basis. Quintain is delivering the UK’s largest build to rent development at Wembley Park with over 5,000 homes managed by their residential management company, Tipi. The deal will see over 3,000 apartments kitted out with the latest ”connected” appliances including smart fridge freezers, ovens, hobs, dishwashers and washer dryers. 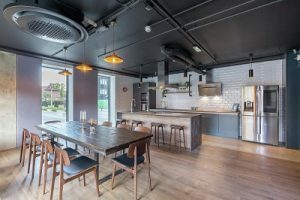 As part of the rollout, Samsung will be installing their appliances not only in the apartments but also in the shared social spaces (pictured above), which are part of Tipi’s all-inclusive lifestyle offering. Samsung connected devices include their ‘Family Hub’ fridges, which have built-in cameras allowing residents to see exactly what is inside their fridge from their mobile phone, and track the freshness of food items. With a connected fridge, residents can order groceries directly from the panel on the fridge door, use the internet or play music from the appliance while they cook. Samsung has done a number of leasing deals in the hotel sector, but this is the first within the build to rent sector. The deal guarantees that the appliances will be fully maintained and regularly upgraded, ensuring all Tipi residents have the latest products in their homes.